Malasada (insert Wiki link here, please). 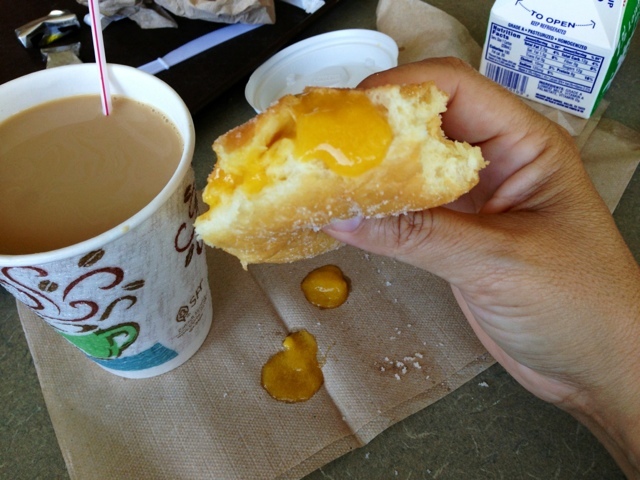 This is a Tex Drive-In, fresh mango malasada. And I confess: I ate it, and I liked it. I also liked the second one, plain, which is traditional, that I ate, too. The first time I had a malasada I had to overcome the name. It is Portuguese, but I read it in Spanish, and always hear "badly roasted." Not too tempted to eat anything "badly roasted." But in Hawaii, at Tex Drive-In, they are legend, and the pressure to surrender sways the appetite, so fifteen years ago I tried one. And I thought: eh. It was a cold donut. A bit heavy, bland. I respect everyone's right to deep fried confection heaven, but it wasn't my idea of caloric bliss. And since then I've politely declined, saving my appetite for a Scandinavian shave ice, li hing mui, please (insert link to Alii Drive location, here). Well, yesterday morning, ravenous and all out of groceries, we found ourselves at Tex Drive-In, where the malasadas were being freshly made, and Geoff was, again, defending their virtues, because he knows what it means to have them fresh. Fine. I surrendered, pride and conviction, and asked him to get me one... just one, fresh mango, mahalo. He probably noticed me scrunch up my nose a bit, roll my eyes. But, now I have to confess: I liked it well enough to be building a ravenous craving for just one more as I write this post. A fresh malasada is... Well, let us not over glorify it...a fresh malasada is a delicate, fluffy, donughty pillow of local flavor. It's pretty darn tasty. It's a warm puff of sweet carboliciousness. 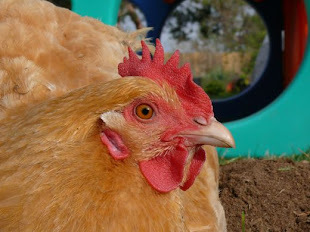 It's... it's a twelve minute drive into town... longer if there are chickens crossing the road! Oh my. It would be a favor to the guys to bring home a hot box before they go up to the top of Mauna Kea today (insert link to Wiki about highest two hour assent from sea level, here, please). They are about to experience sub-freezing temperatures and a forty percent drop in oxygen... A filling, fresh malasada may be the key to their survival!! Malasadas and Mauna Kea... you are making me want to go back. I agree. The thing that makes any fried dough covered in sugar taste great is to eat it fresh and warm! Cold...not my favorite either. I like the original malasadas and also the coconut cream filled ones. Thats funny about the spanish translation. I never realized it until you pointed it out!